Description: Michael Birch, standing center, instructs children as cameramen look on during filming of Kellogg's commercial at Joyland Amusement Park, 2801 South Hillside Street. Photograph was taken June 5, 1972. View is looking north. Description: View of lily pond and landscaping at Park Villa in North Riverside Park. Opened in 1913, Park Villa was planned by Mrs. Laura Buckwalter, a resident of the North Riverside area who believed a shelter and rest room was needed in the park. Description: Aerial view of downtown Wichita and residential areas beyond. View is looking northwest. Parking lots dominate nearly every block south of main business district. Keywords: Wichita, aerials, bridges, rivers, buildings. 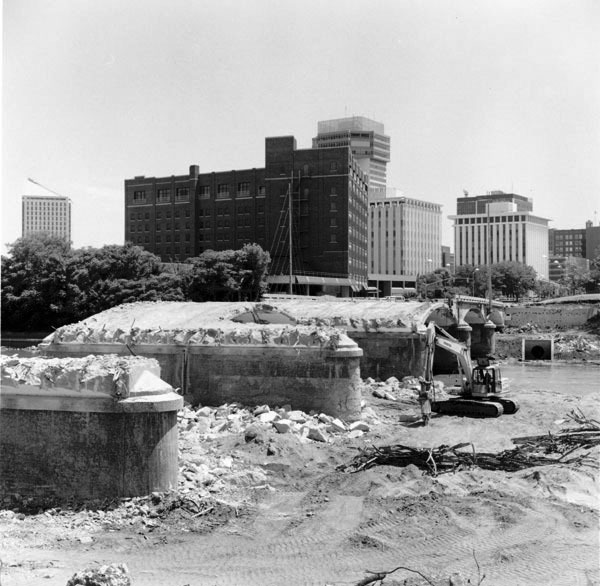 Description: Demolition of Douglas Avenue bridge in summer of 1998. View looking northeast from west bank of Arkansas River. Broadview Hotel and Garvey Plaza in background. Keywords: Wichita, bridges, rivers, street scenes, downtown, construction. Description: View looking east from McLean Boulevard and Douglas Avenue intersection toward downtown Wichita. Reconstructed in 1999, Douglas Avenue bridge features pedestrian walkways, seating and 60-foot steel towers. Broadview Hotel, Century II Convention Center, Expo Hall and Hyatt Hotel along east bank of Arkansas River. Keywords: Wichita, aerials, street scenes, rivers, bridges, buildings. Description: View looking southeast toward downtown Wichita from confluence of Little Arkansas River and Arkansas River. Confluence is marked by "Keeper of the Plains" statue by Wichita artist Blackbear Bosin. Completed in 2000, unusual building on river and along west bank houses Exploration Place science center and children's museum. Keywords: Wichita, aerials, rivers, libraries and museums, bridges, buildings.